I don’t know what I’m worse at doing regularly: blogging or journaling. Both of the above are on my New Year’s Resolution’s list, which you wouldn’t know, because I haven’t posted in over a month. Whoops. Fail #1. So onto my blog about resolutions. The idea of New Year’s Resolutions stretches back to the ancient Babylonians, so I’m thinking we can’t scrap the idea, even though maybe we should. 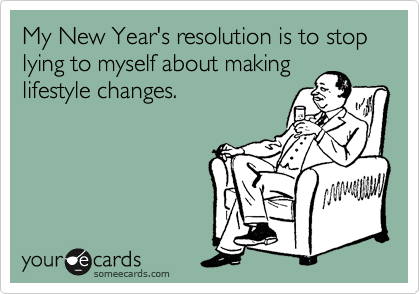 A 2007 (almost as old as the Babylonians) study showed that 88% of people fail at their resolutions. Good to know I’m not alone. If you’re making a resolution because you want to be happier, healthier, wealthier, and/or wiser, failing at it is going to pull you down the toilet bowl head first. That presents an argument: is it better to not set goals to better yourself if not succeeding makes you feel like a failure? I would argue straight down the middle, because it depends on the person. Let’s use working out as an example, because that’s another one of mine. Each person’s reaction to not reaching a workout goal for, lets say, a month, will be totally individualized. One person may be motivated even harder the next month to make it to the gym, one person may feel completely defeated and never step foot on a treadmill again, and one person may be just fine with not quite reaching the goal, and eat an ice cream cone. The latter is based off of me, yes. I’ve never been a fan of extremes, so it’s hard for me to say “you should make resolutions and you should follow through and you should meet all of your goals and you should you should you should!” because life happens, and things prevent us from keeping all 27 resolutions we set at 11:59 on December 31st. Something I loved that I saw on Facebook was this image. Had I not read the comments of the mom on the left (total a-hole), I would see both sides. If she at all came off as a kind or encouraging person, which she certainly does not, I think the mom on the left could be seen as showing off her accomplishments and saying that there is no reason other women can’t do the same. That is totally true. I wholeheartedly believe that anyone can follow through on their resolutions and goals. But that doesn’t mean we all have to have the same goals. The mom on the right isn’t worried about getting off the baby weight and getting a six pack. Alright! There’s nothing wrong with that. She has different things that she’s focusing on, and more power to her. The other “extreme” that I was talking about would be completely pushing aside resolutions and basically saying “screw it, I’m perfect” or “screw it, I can’t keep a resolution anyway”. Either way, you sound ridiculous. You certainly are not perfect (nor am I) and you certainly can keep a resolution (as can I). In my opinion, none of those viewpoints are healthy approaches. You shouldn’t have to keep a resolution like there’s a gun to your head, and you shouldn’t sit in a pool of self-pity or lethargy and not attempt to better yourself, even in a small way. The moment has arrived, my big reveal of what we should do instead of New Year’s resolutions. Ready? It’s big. It’s life changing. It’s world altering! Yeah, it’s not any of those things I said before. It’s just easier to attain. Setting a goal for an entire YEAR is impossible. I know we’ve all heard it from “the experts” (how do you get to be an expert on New Year’s resolutions anyway?) that it’s better to make small goals and build them up to finally reach a bigger goal. What better way to do that then to use the small increments of a year that are already set out for you!? I can’t be the first person to think of this. If I am, I should copyright it. I don’t know how copyrights even work, can I copyright an idea? Back to the point. I’ll share some of my goals, and maybe encourage you to do the same. Goal 1: Overall health and fitness. The dietary part of this went down the tubes for January, because I’ve had a serious hankering for ice cream, chocolate, nachos, and basically anything bad for me. But each month I set a goal of what percentage of the month I work out. I killed it in December, getting to 58%. I knew my January would be a little crazy, so I made January 50%, which equals out to 16 days. Very do-able: it’s less than 5 days a week, which is the recommended amount. I alter the number by how I do the previous month and how busy my schedule is going to be so that it’s always an attainable number. Goal 2: Do a 5k. I’m not a runner. I hate running. It’s hard, and it’s tiring, and my thighs rub together and it just really doesn’t feel good. But a 5k is not that far and not that hard. (Sidenote: I’m doing one with my boyfriend and his sister and her boyfriend, and it’s a “wipeout themed” obstacle run. It’s going to be amazing. Check it out. http://rocrace.com/ . But that doesn’t count as my real 5k.) My goal is to do it by April. Goal 3: Spend time alone, either in silence meditating or praying or doing a devotional. I haven’t done this one day yet, but I am going to start really trying in February. I’m going to start it out at 2 minutes, and if I do it regularly for a month, I’ll try to increase it to 4 or 5 minutes for the next month. Goal 4: This one is my favorite. I started it in November, but decided it would be a major resolution for me. I have an empty jar, a sharpie, and index cards on a table in my room. Whenever something happens that makes me feel something strongly, I’ll write it on the card and drop it in. While I’m hoping most of them will be happy, it’s okay to put sad or angry in there too. I’ll take them out and look through them every 3 months, and it’ll keep me in the moment even after the moment has passed. Another thing like that is my gratitude journal. Shout out to the woman who made that a household name- the one and only Oprah Winfrey. It’s on my phone, and I write down gratitudes for every day, and I can add a thumbnail picture to the calendar. It’s a great way to stay thankful and remember how blessed I am. I’m going to sum it up now, because I’m ready to workout! (Woohoo, thanks for motivating me, blog!) Don’t feel down if you don’t keep goals for a year. I certainly am not. I’m ready to start off every month with a clean slate, and hopefully be part of the 22% that do end up keeping their resolutions.